The premium wheelbarrow for construction. Tradesman Metal XLXP Double Galv. All the benefits of the Tradesman Double Galv. wheelbarrow, but with a puncture-proof wheel. The Tradesman Metal XL Double Galv. is a premium metal wheelbarrow for the construction industry. It is designed for rough work in demanding construction conditions. It is ideal for mixing, transporting and placing concrete; carrying construction materials and tools; and it makes a comfortable seat! The Tradesman’s low centre of gravity when carrying large loads gives the wheelbarrow stability and good balance, earning it top marks for agility and productivity. It is a premium trade quality wheelbarrow with great handling. It rides on a wide puncture-resistant wheel and stands on our hot-dip galvanised frame and legs. It is especially designed for hot work, which softens paint finishes and contaminates hot-mix. 100 litre, 160kg capacity steel tray. 1.2mm thick, hot-dip galvanised steel. The thick, tough tray has a big, flat, bolt-free base for stacking materials. Ideal for resisting impacts and sharp, heavy, bulky and abrasive loads. The cantilevered, focused, jug-like pourer spout makes easy work of accurately placing concrete or tipping asphalt. The wide tray base means you can carry ten or more concrete blocks safely. The shape and position of the tray makes light work of heavy loads. Mounted on the rugged Tradesman chassis. Heavy duty galvanised tube frame. Hot-dip galvanised legs, braces, nuts and bolts. The handgrips are a unique non-slip design. Even in wet and greasy conditions your grip is uncompromised. 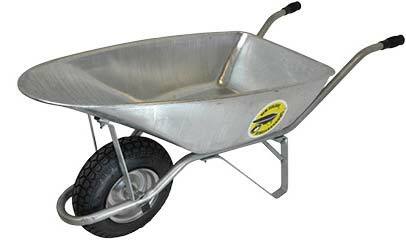 "The Tradesman Wheelbarrow offers outstanding value for all trades. It's designed for New Zealanders and will last for decades."